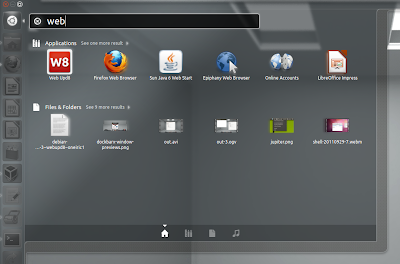 GNOME 3.2 got a "web application mode" through Epiphany web browser, allowing you to save websites as web apps. These web apps show up as regular applications in both GNOME Shell and Unity and can be pinned to GNOME Shell's Dash or Unity's launcher, etc. 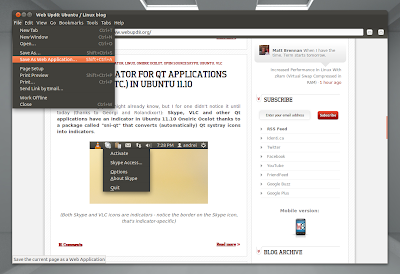 More about them in this post: GNOME 3.2 to get web application mode. The latest Epiphany is not available in the Ubuntu 11.10 Oneiric Ocelot repositories so I've created a new PPA for GNOME 3 stuff and uploaded the latest Epiphany 3.2.0 and WebKit 1.6.1 (required dependency). To save a web page (like Twitter.com, Facebook.com, Gmail or whatever), in the latest Epiphany 3.2.0, select File > Save as Web Application. But please not that for now you can't select an icon or a custom website region for the web app icon so the icons will need further tweaking by replacing the images under ~/.gnome2/epiphany/app-epiphany* (where "app-epiphany*" is a folder stat starts with "app-epiphany" followed by the web app name and some numbers/letters) and then restarting Unity / GNOME Shell. The Epiphany Browser package in the new GNOME 3 WebUpd8 PPA is the same as in Michael Kuhn's PPA (thanks! ), but I've created a different PPA because I want to add some more GNOME 3.2 packages which are not available in the Ubuntu 11.10 Oneiric Ocelot repositories and I wanted to have them all in a single PPA.